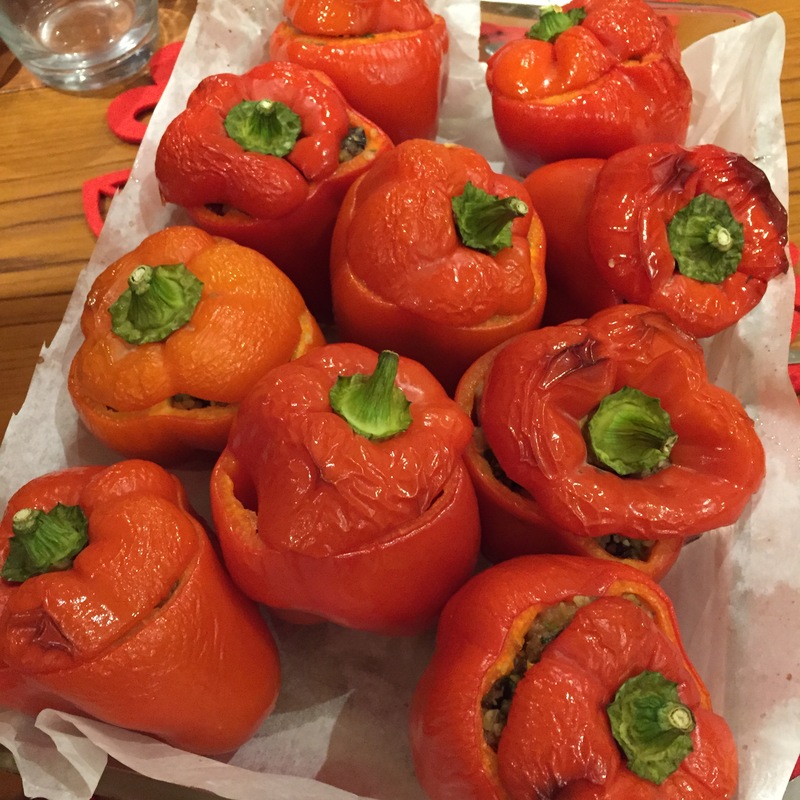 Peperoni imbottiti… Stuffed peppers. My Mum made them very often for us. The combination of sweet and sour or agrodolce is one of the hallmarks in the flavour pantheon of Neapolitan food. These are very simple to make and may be a main or a side dish. This is my rendition, with tweaks and adaptations, of my Mum’s recipe. The quantities provided are sufficient for 10 peppers (organic ones, which can be slightly smaller). Recipe after the photo. 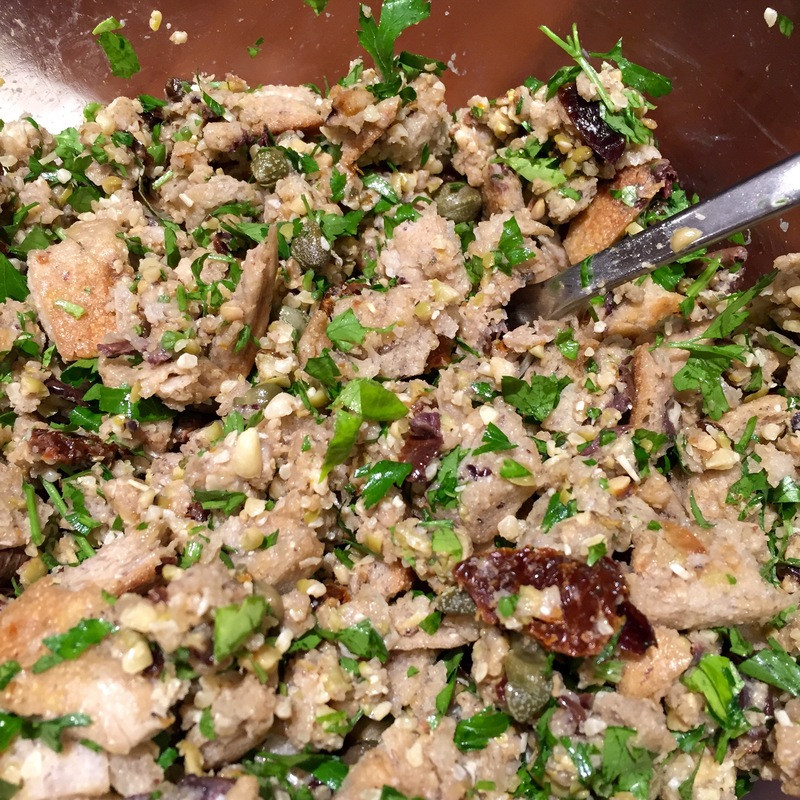 In a food processor (see below if you don’t have one), combine the bread, sun dried tomatoes, olives, prunes/raisins/sultanas and pine nuts (capers and parsley stay out). Pulse a few times to get a chunky consistency and not too smooth. Then transfer the mix to a large bowl and add the rest of the ingredients. Drizzle olive oil onto the mixture and mix well. See photo below. If you don’t have a food processor, don’t worry. Just make sure that your bread is chopped up well, roughly chop the olives and leave the pine nuts whole. Mix everything very well in the large bowl as above adding the rest of the ingredients. Set aside the mixture to soak up the flavours and start preparing the peppers. Slice the top of each pepper and set aside. You will need the tops later. I like to keep track of which top goes with which pepper because it makes it easier later. Remove the seeds from the inside of the pepper. Now, stuff the peppers. Use the back of a spoon and/or your fingers to really cram as much in there of the stuffing mixture as you can. 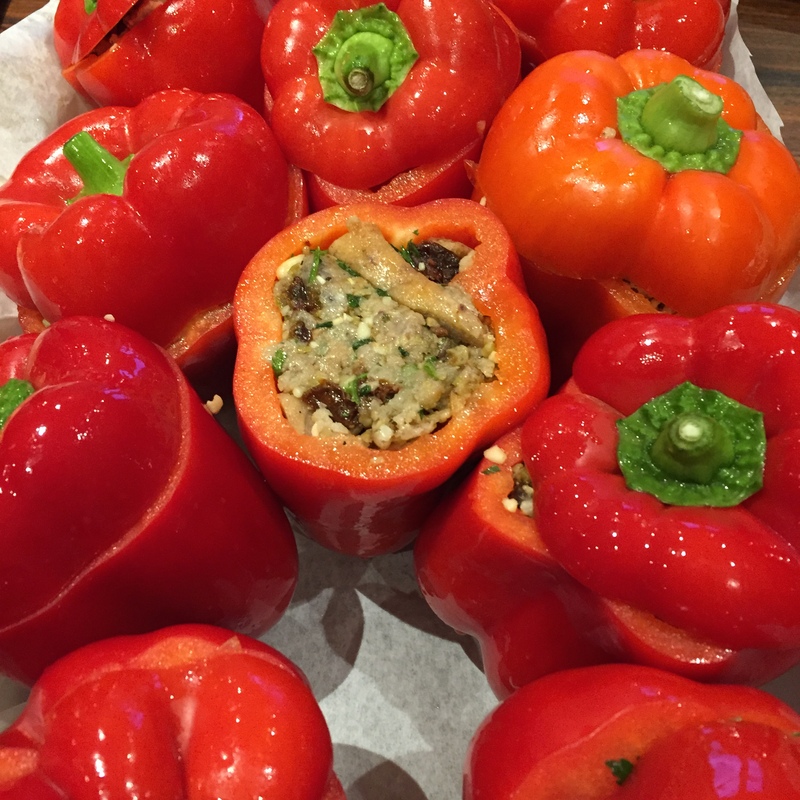 Before transferring the peppers to the baking dish, drizzle a bit of olive oil into each stuffed pepper. Place a small drop of olive oil in the palm of your hand. Coat the exterior of each pepper and its top. Arrange in the baking dish, covering each pepper with its top. 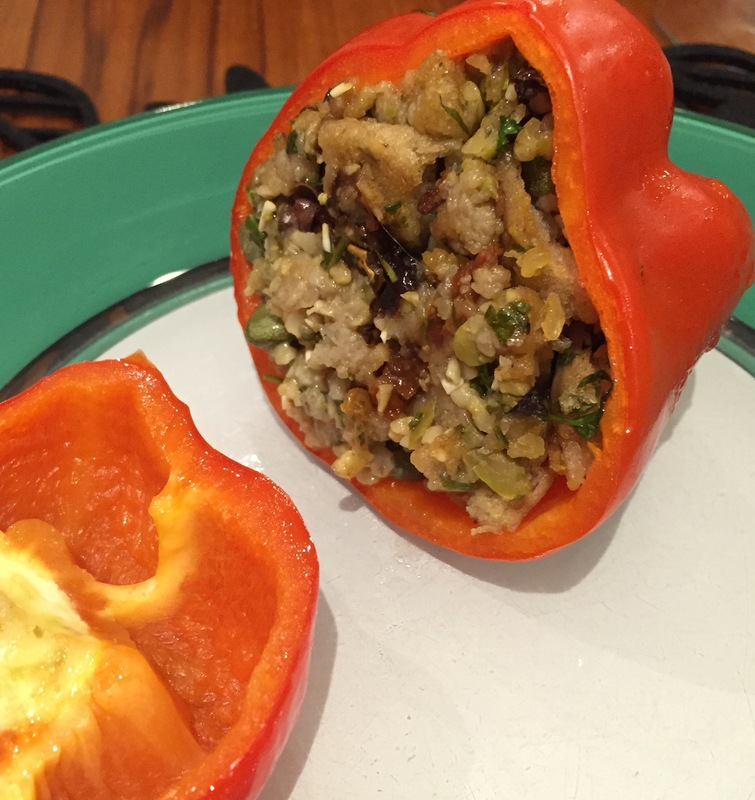 Bake the peppers for 40 minutes (or more if you like them more well done and softer). 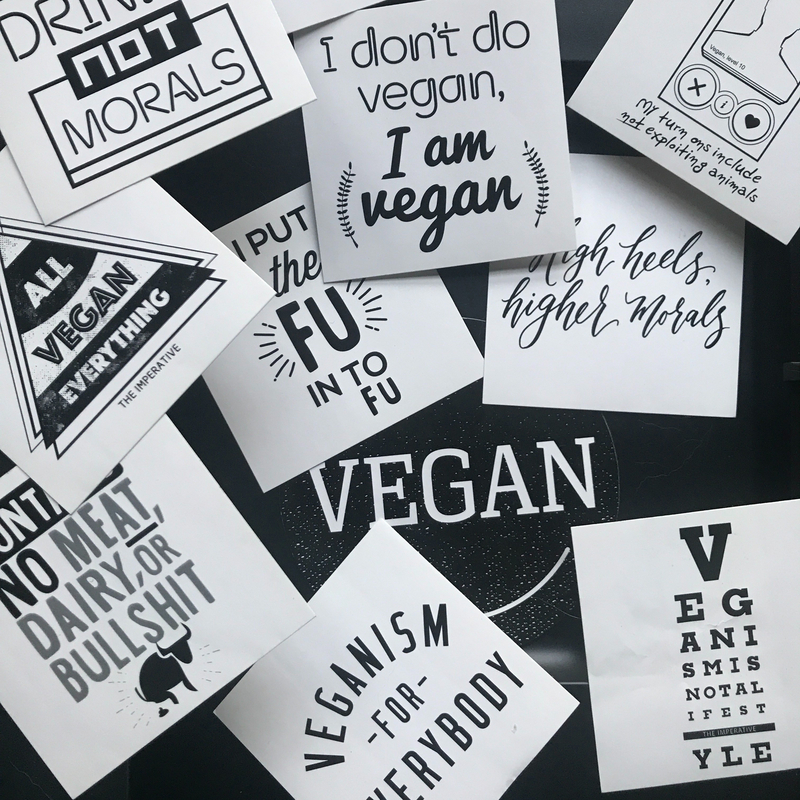 There is no good reason to use animals. Please go vegan. It’s easy.